WINDSOR, CA. — Retired MLB catcher Ivan Rodriguez will appear on November 20, 2014 at 1:00 pm at the Glory Days Memorabilia Autograph Signing event located at 513 David Clayton Ln., Windsor, CA. Source: SFGate. Photo shows former Tigers catcher Ivan Rodriguez on Aug, 2, 2014 at Comerica Park. 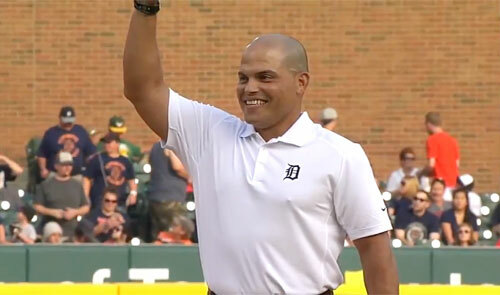 Watch Ivan Rodriguez throw the first pitch from home plate to second at Comerica Park Aug. 2, 2014. Iván Rodríguez, nicknamed “Pudge,” is a retired MLB catcher. During his career, he played for the Texas Rangers, Florida Marlins, Detroit Tigers, New York Yankees, Houston Astros and Washington Nationals. He won the World Series with the Marlins in 2003, and also played in the 2006 World Series with the Tigers. On June 17, 2009, Rodríguez set a MLB record by catching his 2,227th game, passing Carlton Fisk. Rodríguez announced his retirement on April 18, 2012. He signed a one day contract with the Rangers on April 23, and then retired. Ivan is an excellent motivational speaker. For booking Ivan Rodriguez as your next speaker or to book Ivan Rodriguez for an appearance, contact Ivan Rodriguez’s booking agent at Sports Speakers 360. Will you be doing send-ins for the Ivan Rodriguez signing event. I would like to send in a couple of lithographs I am hoping to use for my charity events.